dolmades | eating with S.O.L.E. OK this is crazy cool, We have crazy big grape vines here about 6 really hearty vines that produced well over 50lbs of grapes last year and are poised to do way better this year! Well it has only taken 4 years, but we finally harvested grape leaves and for the first time ever I made dolmades. So fun and lovely tasting. I am considering canning a good amount of leaves right now… but I might just steam and freeze them for future days. 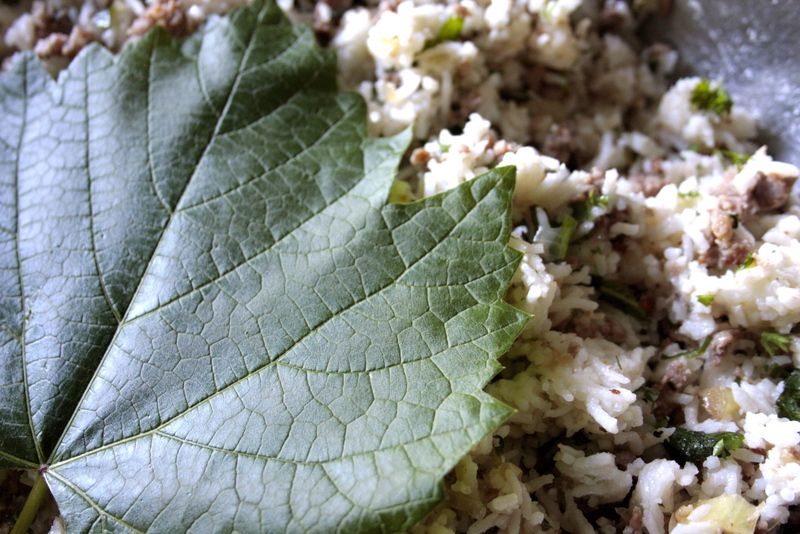 I had some ground pork from our pig at the ready, along with some leftover rice and ample fresh herbs on hard, which all combined to make bright refreshing and delicious dolmades! 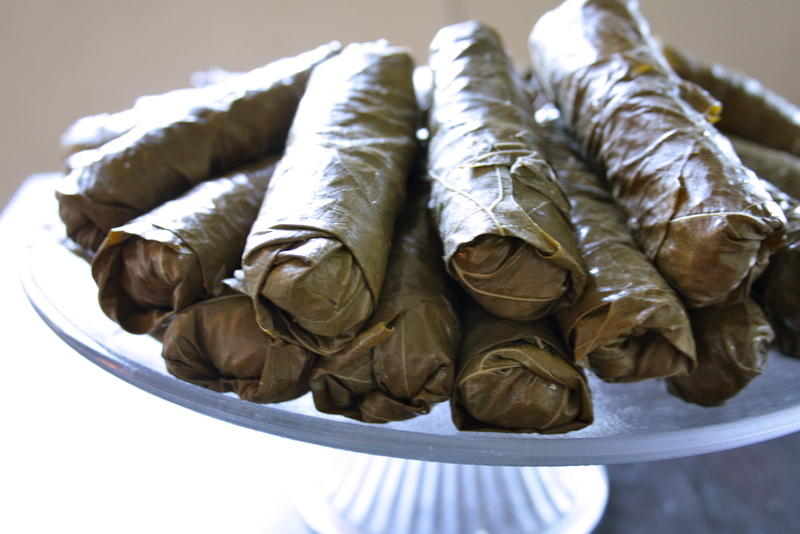 The grape leaves were really easy to process and roll, and I am sad I have overlooked them for so long.This batch made a million dolmades, actually closer to 50 which fed my small army dinner one night and then a lunch side the following day. So scale this appropriately. In a deep pan fry 2 medium onions in a little glug of olive oil. Season with S+P and 3 cloves of garlic chopped fine. Once translucent add in 1 lb of happy ground meat (lamb would be lovely). Season with a huge handful of freshly picked and chopped parsley, mint and dill. Cook meat and onions until nicely browned, then set aside. Toss meat with 4 cups of cooked rice in a large bowl and season everything to taste with a hearty amount of: olive oil and lemon juice, more fresh herbs; mint, parsley, oregano and dill and of course S+P. Now for the grape leaves, if you have fresh ones cut the stem and any course veins in the leave base, quickly place each leave in a shallow boiling water bath for about 1 minute or until the leaves change colour to a deep green. Remove leaves and lay out on a tea towel to dry. Once you have processed all the leaves it’s time to start rolling. Not unlike spring rolls when your rolling be mindful of volume and try to keep the same amount of filling in each leave to have consistent looking dolmades. Place the filling, which you can kind of squeeze in the palm of your hand into a tube like shape, at the base of the leave. I rolled mine away from my body (toward the tips of the leaves) and I made sure to place the leave vein side up. Start by folding in the sides then in one swift movement using your wrist to you can zip the whole leave into a lovely little package. It only took a couple to get a really striking and similar shape down. From there I placed all the dolmades in a shallow cookie pan with about 1/8″ of water and baked / steamed them at 275 for about 30 minutes. You can then cool them and serve them warm of cold. I made a nice hummus to dip them in but if you like yogurt I am sure tzatziki is the dip of choice. I was thinking next time I might serve these with a balsamic fig sauce! YUM. If you don’t have fresh leaves then you can skips all the steaming and baking steps and just rock and roll! Add some chopped leaves to your pickles and it helps in preserving and extend their shelf lift.